With a growing population, the demand for crop production is an increasing trend. The main hindrance in this regard is the biotic stresses like diseases and pests attacking crop causing huge losses every year. Mainly the soil-borne pathogens are devastatingly affecting the crop production. It is challenging to predict, detect and diagnose a variety of soil-borne pathogens that are causing plant diseases. The soil-borne plant pathogens can be categorized under divisions of bacterium, virus, fungus or plant parasitic nematode. These pathogens are highly effective due to extensive surviving periods even in absence of host plant and also congenial environmental condition. The survivability of soil-borne pathogens in the soil varies for each of them. Most soil-borne pathogens are difficult to control by conventional procedures like the use of resistant cultivars. Extensive use of fungicides is expensive and affects nontarget microflora. The promising strategies used are crop rotation and cover cropping and using organic amendments (manures and composts) and biological control are alternative methods which can replace the use of chemical pesticides in the control of soil-borne pathogens. In recent years, biological control has become very popular and included in plant disease management, and it is considered as a practical and safe approach in many crops. Among these antagonistic microorganisms, actinobacteria are well-known and classified among the most active rhizobacteria. 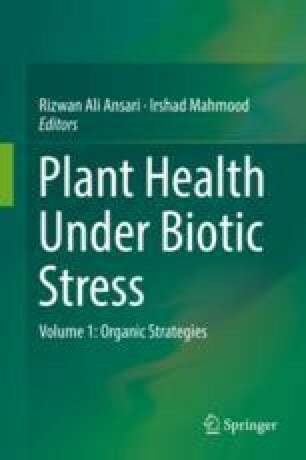 In recent decade actinobacteria have gained importance due to its extensive presence and active colonization ability in rhizosphere of plants, its ability to produce a wide variety of agro-active compounds effective against many pathogens. Actinobacteria, especially Streptomyces spp., have biocontrol action against a range of phytopathogens. The actinobacterial mechanisms imparting soil-borne disease control majorly involve antibiosis, hyperparasitism, production of cell wall-degrading enzymes, stimulation of nodulation, etc. Actinobacteria-treated plants showed ameliorated plant health. The role of actinobacteria, as the probable stimulator of ISR (induced systemic resistance), is a major aspect in disease control. It induces signalling pathway involved in plant disease resistance and produces many defence-related enzymes protecting plants against pathogen attack and also preventing its further spread. Hence actinobacteria are an effective biocontrol agent and can be used for the control of soil-borne pathogens. Baysal-Gurel, F., Gardener, B. M., & Miller, S. A. (2012). Soilborne disease management in organic vegetable production. Available on www.extension.org/pages/64951. Accessed 28 Feb 2016.